We had the pleasure of staying two nights at the Park Hotel Farrer Park Hotel by Park Hotel Group while we were in Singapore and we would definitely recommend it to anyone looking for a great hotel in a happening neighborhood that’s still not far from downtown. You’ll have excellent service, great views of the Farrer Park and surrounding areas, and plenty of options for food within the hotel and neighboring area. Our room on the 19th floor allowed us some very nice views through the floor-to-ceiling windows. Since it was a Club Room we were also given access to the Crystal Club Lounge on the 12th floor. There, you can enjoy breakfast each morning and cocktails each evening in a quiet, private setting. We loved starting off our day and ending our evenings in the lounge because the food was good and it never seemed too crowded. 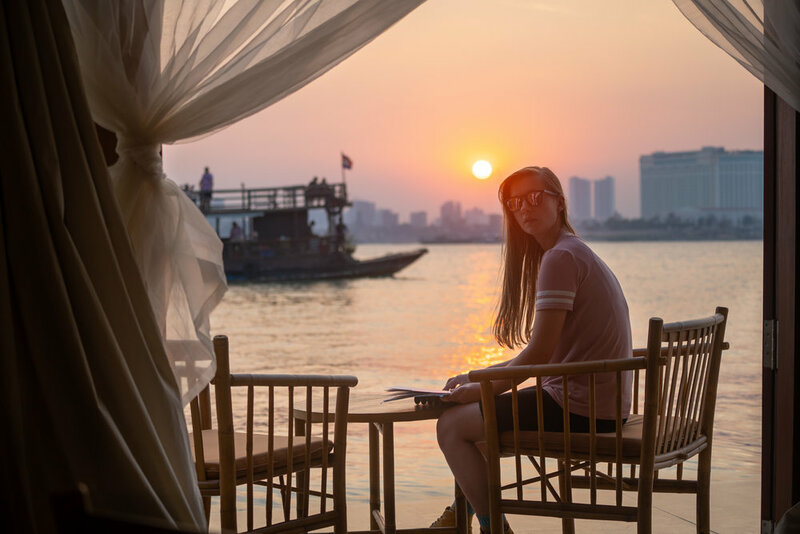 If you’re looking for a tasty bite to eat, but don’t want to travel far then you should check out the Blue Jasmine Restaurant located on the 5th floor of the hotel. This casual, but not too casual (don’t show up in gym or swim gear), restaurant serves up delicious Thai dishes that you won’t soon forget. With help from the staff we were able to order some of their favorite and/or signature dishes. Here is what we ended up having: Cha-Om Fried Egg, Crispy Duck Fillet, Crabmeat & Pineapple Fried Rice, and Blue Jasmine Holy Basil Signature Beef Ribeye. For dessert we had the Mango Sticky Rice and for drinks we had the Blue Jasmine Mocktail. Everything was fantastic. We literally ate all of it, although I don’t think we were actually that hungry—that’s how good it was! 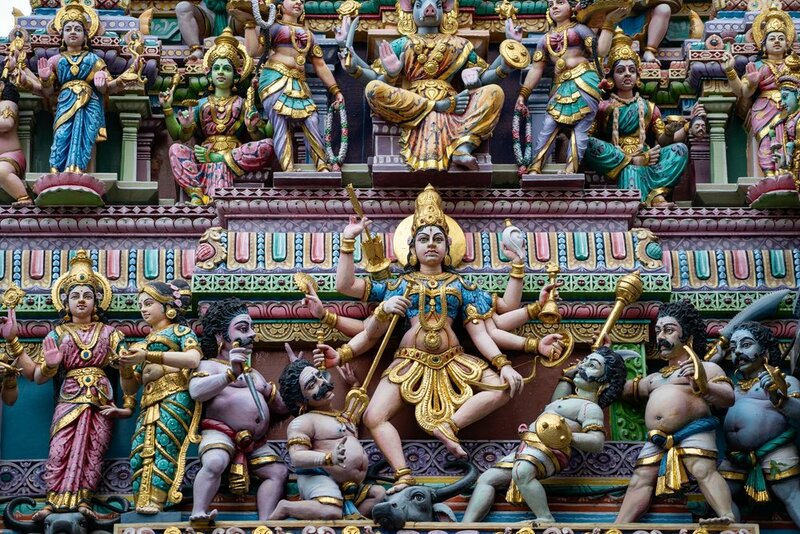 Once you’re up for it, it’s time to go out and explore Little India. This doesn’t have to be a set plan for your day because there are really so many things you can be doing in the area. As you walk around and check out the many temples and attractions just make sure to keep an open mind and stop wherever you think might be worthwhile and looks interesting! In the meantime, here are some ideas for your adventure. If you head down Serangoon Rd. (located right next to the hotel) you will find this temple after a few blocks of walking. It is a Hindu temple with many elaborate sculptures and details. It is also very colorful and nice to look at! 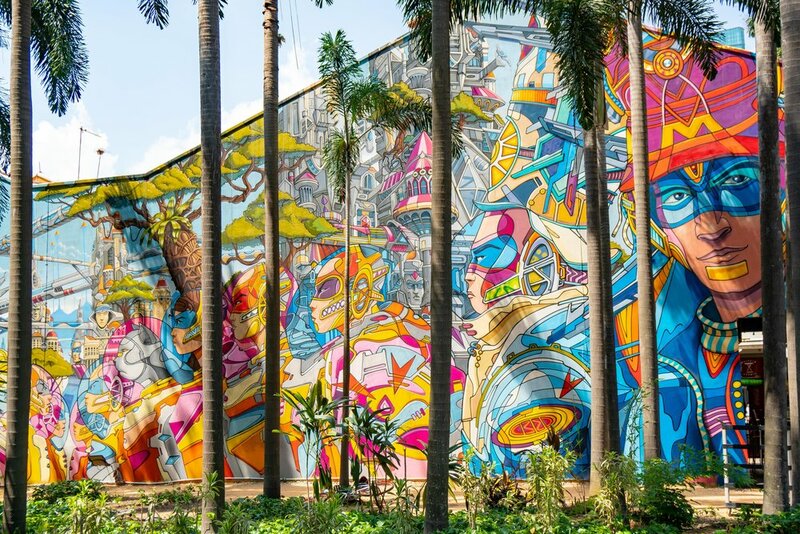 This brightly-colored Chinese villa is set in the middle of a happening area where you’ll find plenty of street art and murals all around. Here, you’ll also find plenty of locals enjoying some time with friends and/or family around a table of food/drinks. The Tekka Centre is almost adjacent to the Tan Teng Niah villa and is well worth a visit, especially if you’re looking for some tasty food. A lot of people complain about a certain smell in the air here, but we didn’t notice too much once we were well inside. There should be plenty of seating around since the place is so big, but it can also get quite busy. 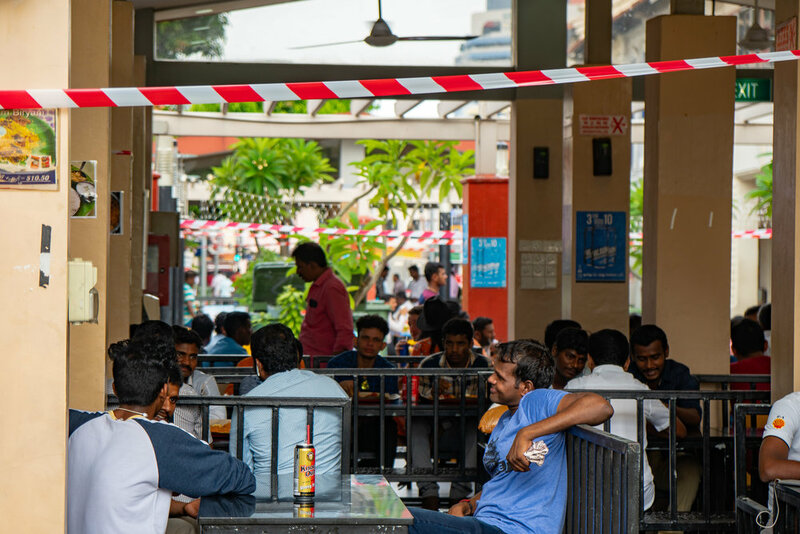 Once you’re finished up at the Tekka Centre, take a stroll across the street to see what the Little India Arcade is all about. This is a semi-open shopping area with a variety of stores to pique your interest. A short walk away you will find the Abdul Gafoor Mosque. This mosque was originally built in 1907 and has been restored since that time. For us, it was interesting seeing a building with this color combination and architectural style. Heading to the opposite side of the hotel you will find even more temples. One of those is the Leong San Temple. As you can tell from the picture, this Buddhist temple’s looks are drastically different compared to the Hindu temple and Muslim mosque we also visited, which is one of the reasons we wanted to stop by. Just down the street you will find the Sakya Muni Buddha Gaya Temple. Although we didn’t go in to see it, this Buddhist temple features a 15-meter high seated Buddha. 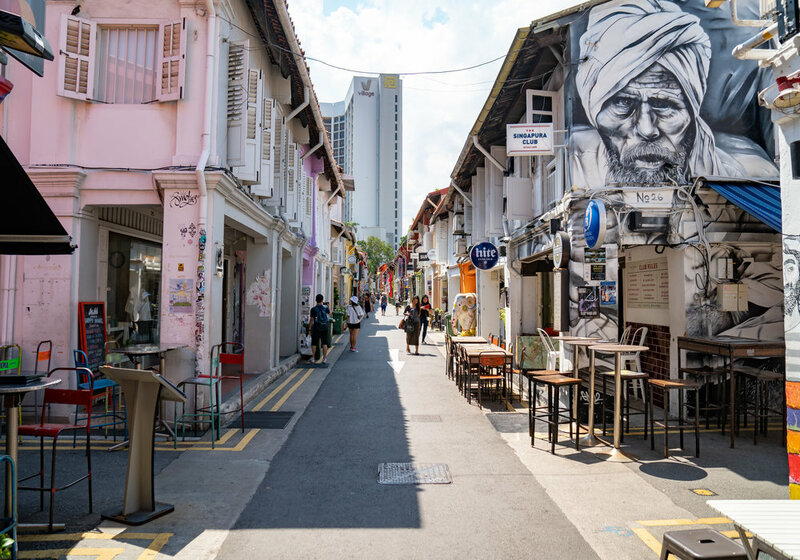 Although this isn’t technically in the neighborhood of Little India, it did become part of our experience while we were staying at the Park Hotel Farrer Park because we left Singapore after our stay there. Needless to say, if you’re in Singapore then you’ll be at the airport at some point and you’ll find yourself in close proximity to the brand new (as of April 2019) Jewel at Changi. Do yourself a favor and stop by for a bit. It’s really just a big shopping center, but the free attractions they have available are quite nice to enjoy, including seeing the HSBC Rain Vortex. Also, you can easily connect to any terminal from Jewel and store bags or do early check-in with certain airlines. 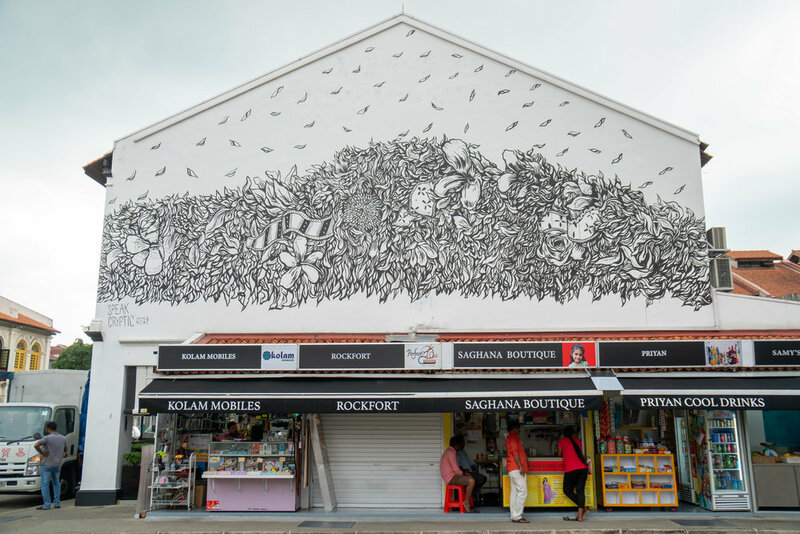 Thanks for reading and please let us know how you’ve spent time in Singapore and specifically the Little India area! 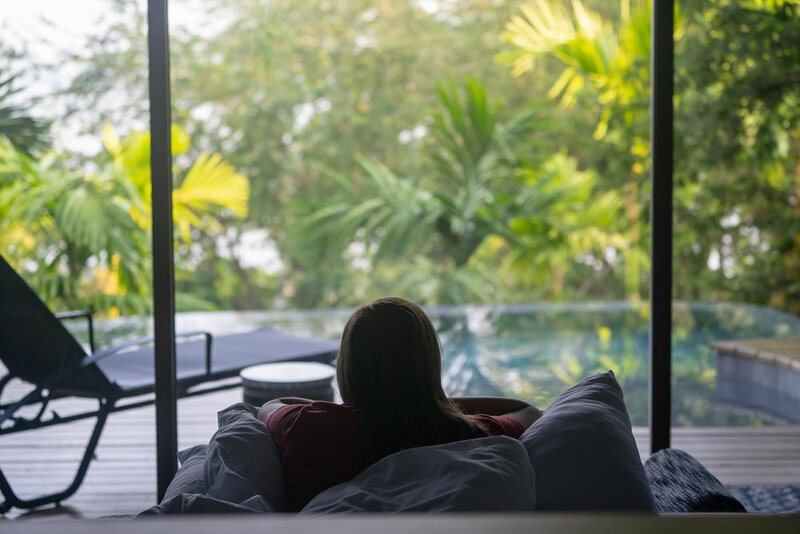 We spent two nights at Destination Singapore Beach Road by Park Hotel Group and loved the location because it made it easy for us to check out the local sights. The hotel is conveniently located close to downtown (just two stops away from Gardens by the Bay if you take the MRT from the Nicoll Highway Station), but there are also plenty of options for activities in the immediate vicinity as well. First, you should enjoy the hotel itself. The rooms are nice, especially if you get one with a couch to enjoy the views of the surrounding city. 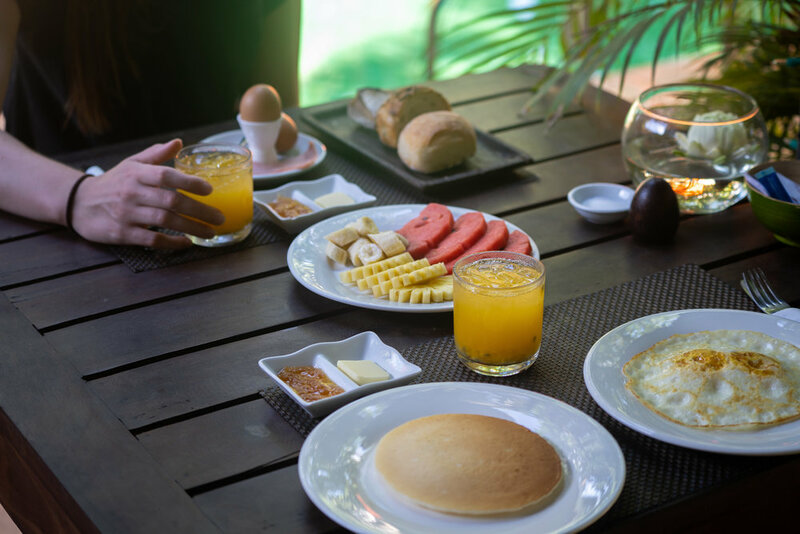 The breakfast buffet is a great way to start the day, but make sure you get there at reasonable times so as to avoid the late rush as it can get a bit crowded. If you get the chance and feel up to trying something new then you should definitely check out the hotel’s restaurant, Folklore. Here, you’ll find traditional Eurasian and Peranakan dishes such as Beef Cheek Rendang and Peranakan Chap Chye. For the uninitiated, some local dishes can be quite spicy, so just beware! I especially loved how tender the Beef Rendang was, but, oh my, did the sauce pack some heat! When you’re ready to head out from the hotel and check out the local food scene all you have to do is walk next door or across the street. The area of the Golden Mile buildings is called “Little Thailand” because of the heavy Thai influence here with the shops and stores. 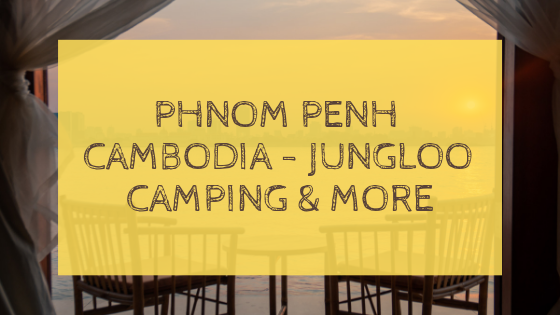 However, you can find different types of cuisine all over the place. You know it’s good when the locals are pulling up plastic chairs with their friends. You can find dishes for around $3 SGD (Singapore Dollar) in the area, which is about $2.20 USD (US Dollar). A for-sure stop in the area should be Haji Lane. It’s colorful, filled with history, and has lots of little shops and eateries for you to peruse. One of the biggest draws to coming here is checking out the cool street art all over the place. Get your cameras ready and head down to start snapping those shots. 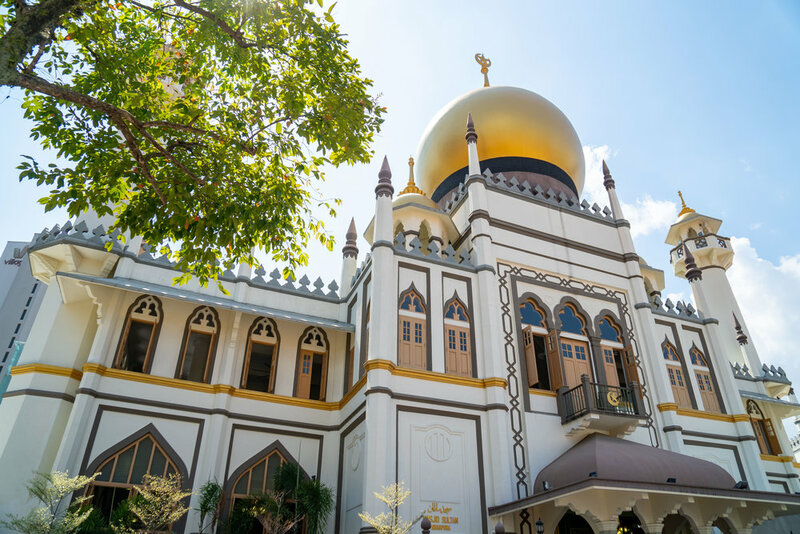 The Sultan Mosque is located just around the corner from Haji Lane and should be on your list of things to see in the area. The large, golden dome is hard to miss, especially if you’re coming down the street located directly in front of the mosque. The Masjid Sultan was designated a national monument in Singapore in 1975. 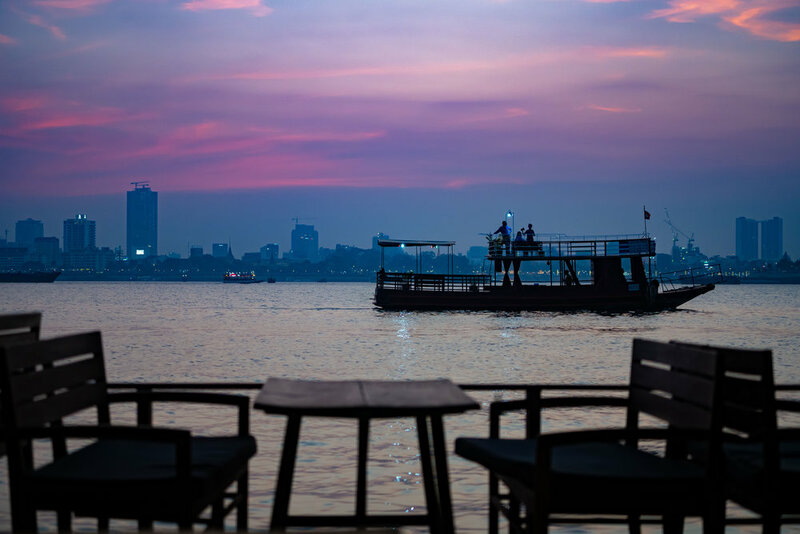 These aren’t necessarily “in the neighborhood,” but they deserve a visit all the same and they’re only two stops away on the MRT (walk around the corner to the Nicoll Highway station and then get off at the Bayfront stop), which is basically right next door! If you’re doing a two-attraction pass then we recommend the Flower Dome and Cloud Forest. They’re both indoors and air-conditioned! Our first stop here was the Flower Dome, which is one of the big domes you’ll see as you’re walking around the area. It, of course, will have lots of beautiful flowers! When we went there was the Tulip Festival happening, which was celebrating the culture and heritage of The Netherlands. This is a great stop on your visit to the Gardens, especially if you’re planning on going to the Cloud Forest next (it’s right beside this dome). 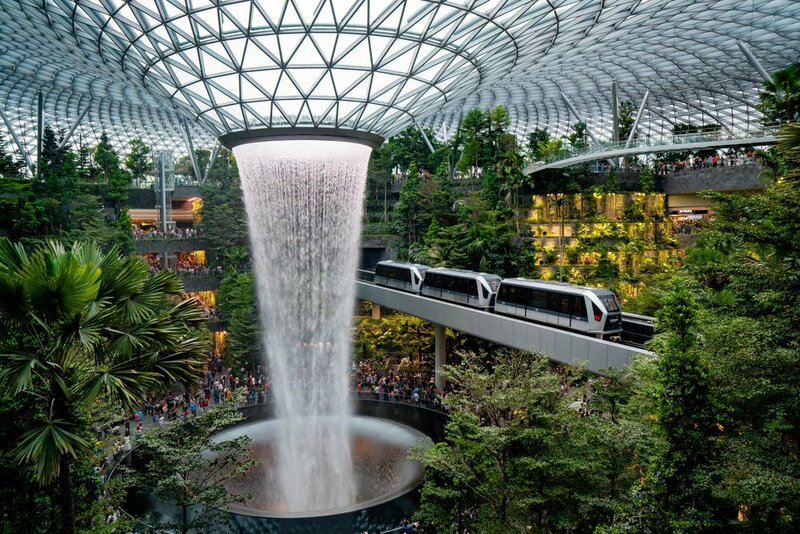 The Cloud Forest is probably one of the most popular and/or famous attractions in Singapore because of how cool it is. The massive waterfall that greets you right at the entrance and then the giant mound of nature that you’ll spend time walking inside and around is really quite amazing. Every now and then you’ll see and feel a nice misting in the area, which further adds to the effect of being in a true, natural cloud forest. Thanks for reading! Please, let us know what you think of these gems and any other gems you know of in the area! The Seri Pacific Hotel Kuala Lumpur was our home away from home during our 4-night stay in the Malaysian capital. Spoiler—it was an excellent stay! We checked in after midnight after a late flight from Bali, but everything went perfectly smooth upon our arrival. The staff was attentive despite the late hour and we were quickly and efficiently given our room keys, relevant information, and then personally shown to our rooms (yes, plural). View from our living room space. Our Club Room was located on the 27th floor and consisted of a large bedroom with a bathtub and rain shower. We also had the adjoining room to ourselves, which was a living/dining room and another full bath. Needless to say, we had plenty of space! We also had plenty of food during our stay. Thanks to a welcoming staff, we were greeted by a fruit basket upon arrival. Also, halfway during our stay we were sent another fruit basket! It was amazing, but since we were already eating multiple meals a day at the hotel, we just couldn’t keep up with how much food we had. What a problem, right? View from the Club Lounge. Since we were in a Club Room we had full access to the Club Lounge located on the 30th floor. Here, guests with club access can enjoy breakfast each day, as well as cocktails and finger foods each evening. We found it a remarkable way to start and end each of our days during our stay. Also, the food was great! It was all buffet-style and ranged from potato wedges to congee. Some of my favorite items were the mango lassi, BBQ lamb, and fried crab cakes. So good. In addition to the food at the Club Lounge we were also able to try out breakfast and lunch at the Zende Restaurant and the Saturday Night Buffet at Kofuku Japanese Restaurant (both located within the hotel). Breakfast at Zende Restaurant was very similar to the Club Lounge except there were more options (and a lot more people!). Lunch at the same restaurant has a buffet option, but we opted to go a la carte. My Old Timer Burger was fantastic. Overall, we had a wonderful stay at the Seri Pacific Hotel and wouldn’t hesitate in staying there again. It’s a great hotel with very helpful and friendly staff. Also, it’s in a good location for exploring the city (plenty of public transportation around). We were the first ones at the train station waiting for this Inca Rail journey, but we did see hundreds of people coming and going on Peru Rail trains. When our train arrived it was a little confusing finding out where we were supposed to go because our ticket showed a certain letter for the car we were in, but that letter wasn’t being displayed on any car we saw. Finally, someone switched out the incorrect letter and the one we were searching for was found. We were first in line to board. It was really nice and cool getting onto the car first and seeing the rows of empty seats. It was also nice to see that not every table had place settings, which meant that we weren’t looking at a full car on this journey. Overall, it was a very pleasant experience with a helpful and attentive staff. Everyone was offered a Pisco Sour to start off their journey (which we kindly declined and we were then given a pineapple juice mixture) and then later on came the meal. The menu consisted of a starter, entree, and dessert. There was only one option for each, so I guess if there were any dietary restrictions you would have had to bring it up beforehand. We thought the starter was very good, the entree was decent, and the dessert was also decent. I loved the non-stop juices that kept coming my way! My only critiques were that the characteristics shown on the website didn’t exactly line up with our actual experience. There was no Observatory-Lounge on our train. I’m not sure what “Subject to a private charter sale” means, but either way we didn’t get that experience in an “elegant, finely-decorated room with spacious armchairs". Also, we didn’t receive any tickets for the bus to the Citadel, which was a bit frustrating since they’re $24 (USD) a pop. However, besides those niggling details, the train ride itself was pretty magical. It’s hard to enhance the beauty of the landscapes along the Urubamba River, but somehow a lot of pineapple juice and comfy seats really let me enjoy it even more. This time around we weren’t lucky enough to have a full section of a car to ourselves where there was nobody sitting in the booth across from us. Actually, our car was almost entirely full. Still, we did manage to snag our own booth after seeing there was one empty by having a quick chat with one of the friendly members of the staff. It’s quickly apparent that there’s just a little less of everything that was good on the 1st-Class on the 360. The seats are less padded. The tables aren’t as spacious. But, really, it’s not a big deal at all. Or any deal, actually. The windows are indeed bigger and wider, including the ones on the ceiling, which is how it should be when you’re on this magical journey in these ancient lands. I’m not sure if this is always the case (maybe it depends on the time), but we were served beverages (tea, coffee, or water) and a meal (chicken sandwich & a chocolate). It’s definitely more than you’d get on this short of a journey were it by plane, which I was grateful for. The big delight, however, of the 360 was that it did indeed have an outdoor carriage. It may not be quite what you’d expect, but I think it did the trick. The carriage attached to our train was devoid of anything at all except the helpful security guard standing in the corner. There was no bar or furniture of any kind. There were, though, large, open windows that you could enjoy looking through. It was prohibited to put anything outside the window, including parts of your body or a camera, for instance. I could definitely see why, too, because, at times, the land itself was quite close to the train and I could foresee something disastrous happening were that rule not in place. Overall, the ride was enjoyable and the outdoor carriage was real. I’m not sure what the InTrain entertainment system is because I don’t recall there being any music or movies. I think we had a pretty great time on Inca Rail’s trains. We both like trains and the experiences were genuinely nice. I do think some items on their characteristics pages should be updated, changed, or clarified on their website, but at the end of the day it wasn’t a big thing. We like trains and we liked our journeys with Inca Rail. The Sonesta Hotel Posadas del Inca Yucay is located in the right in the heart of the Sacred Valley. This hotel has a lot of history and is by far one of the coolest places we have ever stayed. The hotel is built on an old monastery, which gives it the most incredible history and gorgeous scenery. If you want to be in a great location, while staying in a beautiful place full of history, this is the place for you! The cobbled stone pathways that wind throughout the small complex will make you feel as though you are staying in a city of it’s own. The grounds are full of amazing architecture from the fountains decorated with flowers, to the inviting archways, including a quaint little chapel, not to mention the rooms that take you back in time, while still providing all of the modern luxuries we know and love. The backdrop to this unforgettable place is a giant mountain, which was a nice thing to wake up to every morning. The location is close enough to many of the places that are popular within the Sacred Valley, such as Urubamba, Ollantaytambo, Maras, Moray, Pisaq, etc. It is very easy to hire a taxi driver for the day (the front desk can set you up with known and trusted drivers) and have them drive you around to explore all that the Scared Valley has to offer. We decided to only go to the Maras Salt Ponds (which are incredible and definitely worth going to), but there is so much more to see and do from this location. Side note: if you have forgotten to buy any souvenirs, there are ladies scattered around the hotel complex that are more than willing to sell you most of what you would find in some of the more busy markets you may go to. We bought a nice little watercolor painting of some llamas from one of the ladies. Make sure to negotiate the price if you feel as though you have seen it cheaper elsewhere. We were able to negotiate down a little, but in all honesty, most of the prices are relatively reasonable. The town of Yucay, where the hotel is located, is a pretty quiet town with not much to do in it, including not many options for food (although the hotel does have some nice little food places that you are able to enjoy). Luckily, the town of Urubamba is just a short 5 minute drive away. We even saw some people walking between the two towns, although we opted to use moto-taxis as they only cost us 3-6 soles each way ($1-$2). We went over here several times for food and to drop our clothes off at a laundry service to be picked up the next day. Also, did I mention the free breakfast?! The breakfast buffet they served at the restaurant was a great way to start out the day each morning. From fresh fruit juices, to meats and Peruvian dishes and everything in between. It wasn’t a HUGE spread, but it had enough variety and we were pleasantly surprised by it. Heading to Machu Picchu from here is just a short 30 minute drive to the train station in Ollantaytambo and only a couple of hours from Cusco. Whether you are coming or going from Machu Picchu or Cusco, as most people are, you won’t regret staying here and enjoying more of what the Sacred Valley has to offer while staying in a beautiful and comfortable place. Peru Hop is your full-service hop-on/off bus experience throughout Peru. For other countries, there is also Bolivia Hop and Ecuador Hop, although we haven’t tried those out. Basically, you choose a route from their listed options, and then they will fill you in on the rest (including timetables, stop locations, food, accommodations, tours, etc). A hop-on/off bus system is one where you can get off at any of the scheduled stops along your chosen route. Then, you can stay at that stop as long as you want and “hop” onto another company bus that is continuing along the same route. With these increasingly popular systems all you have to do is find out what day and time a bus is scheduled to come through and be at the specified location to be picked back up. What Routes Are Available for Peru Hop? Do note that for each route there is a minimum number of days of availability you need to have at your disposal to be able to complete that route. This does not include the days you would like to spend in each stop. Our stop in Arequipa involved enjoying views of the Cathedral at the Plaza de Armas. First off, I (Ben) lived in Peru for two years many moons ago. I had already been to some of the stops that Peru Hop offers in their routes, but this was Lauren’s first time to Peru and so, obviously, she hadn’t been anywhere yet. So, it was important for us to have an itinerary where we’re seeing a relatively large amount of places within the time we had. I wanted to visit some Peruvian friends in areas I had lived in before, which included Lima and Ica (La Huacachina). However, Machu Picchu is a must-see if you’re going to be in Peru, so that was also part of the list. From my previous experience I knew that a bus would be a viable option for traveling from Lima to Ica and then to Cusco. However, I also didn’t want to deal with having to book multiple buses along the way and worrying about our luggage and finding our way to the bus stations the whole time. Enter Peru Hop. From my point of view, Peru Hop takes out a huge majority of the hassle of doing a bus trip from Lima to Cusco. 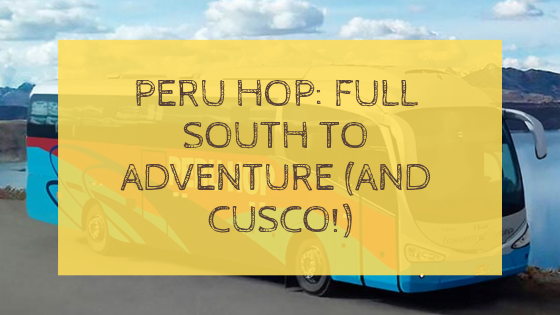 You book your route and that’s basically the end of booking things unless you’re also using Peru Hop to find your accommodations and/or activities along the way. Also, your itinerary can mostly be as flexible as you want because you can stay as many days as you want at any of the scheduled stops and then just get onto a scheduled bus whenever you’d like to continue your route. Very simple. The guides are all at least bi-lingual. Meaning, they will most likely be fluent in Spanish and then have fairly good English. The fluency of English just depends on which guide you get on the bus you’re on, but from the 3-4+ guides we saw, they all had passable English. Also, they all seemed to be doing the best they could. I’m sure it can be hard trying to be fun and make jokes for people that just rode 10 hours on a bus. Yet, try they do. There will be some food stops along the way. You cannot choose where the buses will stop as it has all already been planned and coordinated. For example, on the overnight bus from La Huacachina to Arequipa we stopped in the town of Nazca and had dinner at a nicer looking restaurant. Meals were 20 soles a head and the food was quite good. That amount of soles is about 2-4x the amount you would normally pay if you were just eating the menu del dia from any number of places all over Peru, but I understand why Peru Hop chooses the places they do. A lot of people aren’t used to Peruvian standards when it comes to food and cooking, and a lot of food, if not prepared properly, can be quite dangerous for foreigners. We don’t have any dietary restrictions (vegetarian, vegan, etc. ), but it seemed like there should have been options enough for most people. Most of the time the guides will tell everyone on the bus ahead of time what the meal options will be and then get a head count for each option to let the restaurant know beforehand. Not every bus will be a big, red bus that has “Peru Hop” plastered all over it. At least, that wasn’t our experience. We saw at least 3-4 different colored and labeled buses, but at least all of the seats on each bus had the “Peru Hop” or “Bolivia Hop” seat covers on them. It’s really not a big deal, but some people might be slightly alarmed when the first Peru Hop bus they’re boarding doesn’t say “Peru Hop” on the side of it. 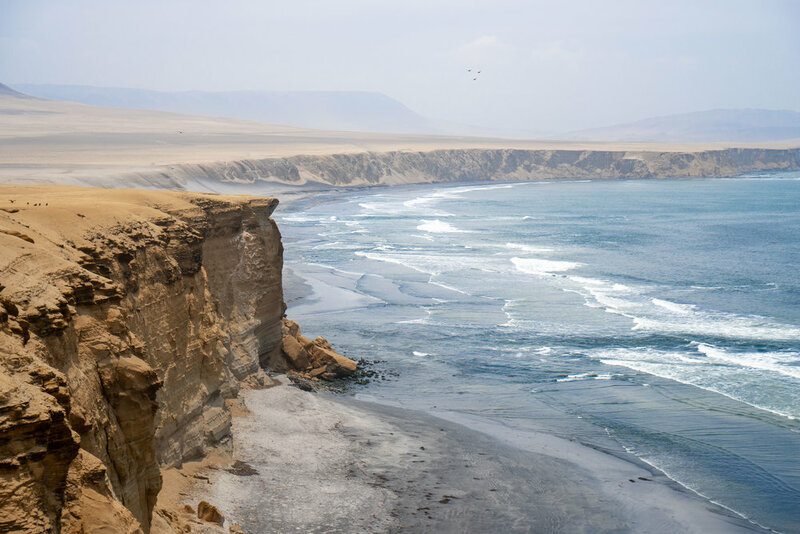 If you’ve spent any significant amount of time in Peru then you should be aware that it’s not the most organized of places, but things still seem to work just fine for the most part. All of the buses we rode on had reclining seats. Don’t expect lie-flat seats because, well, is that even a thing on a bus? I mean, this is a bus ticket you paid $200 or less for, after all. Anyway, I think everything was as comfortable as it could get on a bus. Also, take into consideration that driving in Peru is absolutely crazy, which includes buses as well. Expect to see some ridiculous maneuvers and be on some bumpy and winding roads. I already mentioned it above, but the ease of the journey is the real winner with Peru Hop. Not having to stress about booking things is really great, especially when you don’t have much of an itinerary to begin with. Peru Hop can pick you up from a lot of places in Lima to begin your journey and then along the way you can also be dropped off at a lot of places in each city (unless it’s in tiny places like La Huacachina or Paracas). Normally, there is a designated pick-up location for whenever you want to leave that town/city, but it’s always really easy to find. Your guide can tell you or the informative packet you’re given at the beginning of your tour will give you all the information you need. Also, it’s important to know that you will have a Peru Hop login (once you’ve made your reservation and have received confirmation) that you can use to update what days you’ll be continuing your journey and where you would like to be picked up (there will be drop-down menus that show all the locations). Our stop in Paracas involved going to the Paracas National Reserve. Peru Hop works with a company called “Airport Express Lima” to help the recently arrived and soon-to-be departed get between downtown Lima (Miraflores) and Jorge Chavez International Airport (in Callao). It’s really a great service and very easy to use. Also, prices aren’t bad at all. The buses leave the airport on the top of every hour from 7:00 AM - 12:00 AM. The buses depart Miraflores on the top of every hour from 6:00 AM - 10:00 PM. The buses have reclining seats, Wi-Fi, and air conditioning. Also, the guide on each bus will make sure to help you with your luggage and let you know when your stop is coming up. You can book online beforehand (recommended in case you have questions) or at their booth when you arrive at the airport. We used Airport Lima Express when we arrived in Lima from the USA, when we arrived in Lima from Cusco, and when we departed Lima to go back to the USA. Returning to the airport from the Larcomar stop in Miraflores was the segment we were most worried about because the bus would be coming through traffic and we’d be in the middle of the city. We were scheduled for 7:00 PM pick-up and the bus showed up at 7:05 PM, which was great! This is another company that Peru Hop works with and, of course, they do tours to the famous Rainbow Mountain. We had a tour booked with them the day after we arrived in Cusco (so we could acclimatize a bit to the altitude), but, unfortunately, Lauren fell ill the first day and wasn’t recovered enough the second day to attempt the travel and hike. Also, we wanted to be more ready to do Machu Picchu and didn’t want to chance a relapse into sickness. However, everything in our communication went well with the Rainbow Mountain Travels team and I think it would be a great experience in the future. Definitely wished we could have had the experience, but also not upset because we knew altitude sickness might be an issue. Try to get to Cusco with a lot of time to spare so you can be sure it won’t be an issue if you’re going to try out a Rainbow Mountain tour. We were able to experience a lot of cool things and see lots of amazing places along our Full South to Cusco route with Peru Hop and I don’t think we regret it one bit. There were a few things like Lauren forgetting her water bottle on a bus and then us never getting it back (I really doubt anyone at Peru Hop tried to get in contact with the driver). Or, having a pick-up location forced on us by our guide in Arequipa even though there were many other locations that were closer to where we were staying. Honestly, a bit of laziness all around. Other than little things like that, which you’ll find anywhere, we had a pleasant time with Peru Hop. First of all, let me say that this place was an absolute godsend after taking an overnight bus from Puno, which we barely got any sleep on, and then getting altitude sickness once we arrived in Cusco. The Sonesta Hotel Cusco is located in a great area for anyone wanting to explore the city. 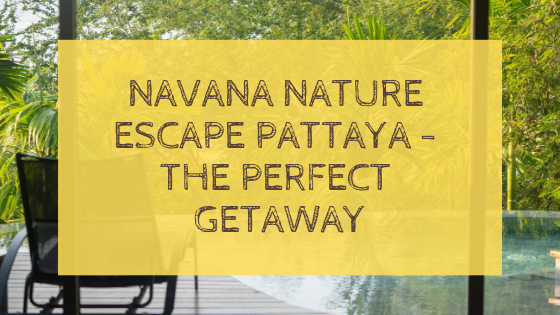 It is only a few minutes from the airport, which they offer free airport pick-up from. They were so kind to us during our stay and even allowed us to check in at about 6am after that aforementioned hard journey from Puno. Enjoying some air and the sights of Cusco from the balcony. Being able to relax and take a bath here was more than welcomed after many 4am-6am cold showers that we had previously experienced in Peru. The place is comfortable with enough space to move around the room and not feel cramped into a little box. The balcony outside of our room was also a nice little touch that we were able to enjoy. As I said before, it is in a great location. Cusco is a fairly walkable city if you are in decent shape and don’t mind walking a little to get to where you want to go. We had no issues walking around and finding the places we were looking for (Ben is also much better at navigating a new city than I am). The hotel is located a few blocks from the Sun Temple (a popular tourist attraction). It was also only a few more blocks from the main square which is a must see. We may or may not have also enjoyed some McDonalds here… sometimes when you are traveling for a long time, it’s nice to just have something you are familiar with even if it is a McDonalds, although the food in Peru is very good. Checking out San Pedro Market. We were also able to find a cool market fairly close to the hotel called The San Pedro Market. This market has many things you may want or need. We were able to finally find a typically Peruvian jumper that I had been looking for pretty much since we stepped foot in Peru (these jumpers are everywhere, but I can be a little picky about clothing). This market has food, souvenirs and awesome little stalls that made you any kind of mixture of fruit juice that your heart desires. We had a tasty blend of mango, orange, and passion fruit. The first morning we were at the hotel and discovered what they offered for breakfast, we were more than a little pleasantly surprised. This was by far the best breakfast I’ve ever had at a hotel to date. We found ourselves looking forward to breakfast each morning and even planning out what we were going to get the next morning. They had everything from typical Peruvian dishes, fruits, fresh juices, breads, egg station, fresh guacamole, little desserts, meats, cheeses, and so much more. Just thinking about this breakfast makes me hungry and wish we could have it every morning! The lovely interior of the hotel. Overall we had a great stay at the Sonesta Hotel Cusco. It is in a great location, has free airport shuttle, nice rooms, friendly staff, and amazing breakfasts. We would definitely stay here again if we were to travel back to Cusco.